Dr. and Mrs. Thomas Naugle, Jr.
*Donations to the Foundation are recorded cumulatively and donors are acknowledged at the appropriate level. 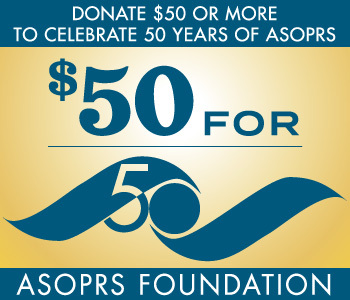 2019 Marks the 50th Golden Anniversary of ASOPRS! The ASOPRS Foundation is looking forward to a 100% participation of all of our members in support of this milestone! Please contribute a minimum of $50.00 (or more!) for the 50th Anniversary. Support ASOPRS. Support the future of oculofacial plastic surgeons! The ASOPRS Board of Trustees met in conjunction with the ASOPRS Fall Symposium, October 25th in Chicago, Illinois. During the meeting, the Board of Trustees continued their work to review and grant Foundation monies to pending projects and initiated the new 50 for 50 Initiative! If you have any projects you wish considered by the Board of Trustees, please submit them to the Chair of the Foundation, Jan W. Kronish, MD at [email protected]. The Board of Trustees will meet in May, 2019 in conjunction with the ASOPRS Spring Symposium. Do you have a grant proposal for the Board of Trustees to consider? Please complete the on-line form on this website and submit electronically to [email protected]. We look forward to reviewing all requests. 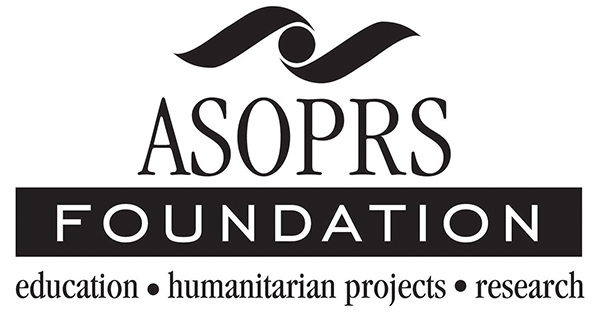 To provide an online donation to the ASOPRS Foundation, go to the Donate Page and half-way down the page, click the donate now button. You will see a login page – please feel free to establish a login based upon your email address. Remember you do not need to login on the top of the page – just on the form provided prior to the Donor Submission form. This will accredit your donation to you for our records and your tax deduction!